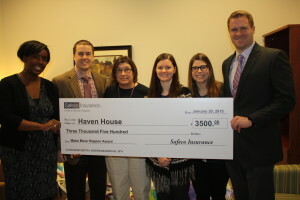 SafeCo Insurance along with John Wadsworth of Strawn & Co., Insurance (pictured second from left above) presented Haven House with a check for $3,500 on 01/20/2015. Haven House was chosen as a recipient in SafeCo’s Make More Happen contest based on John’s volunteer efforts and involvement with the organization. Strawn & Co., Insurance would like to thank SafeCo Insurance as well as the many people who voted online and helped secure an additional $500 for the charity. If you would like to learn more about Haven House and how you can support this great organization, please visit www.henryhavenhouse.org.